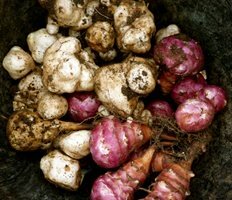 Fresh harvest; pink and brown jerusalem artichokes. Fava greens with radishes, almonds, and sunchokes. Photo courtesy: benketaro Cold sunchoke soup. Jerusalem artichoke contains inert carbohydrates in the form of inulin. Inulin does not get digested in the gut and passes as it is in the bowel movements. Sometimes, this may cause troublesome indigestion problems, especially in those who are new to use them in the food. 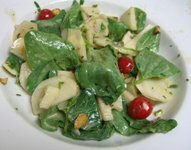 Eating large quantity of roughage may cause gaseous distension and gripping pain in the stomach. (Medical disclaimer). <<-Back to Vegetables from Jerusalem artichoke. Visit here for an impressive list of vegetables with complete illustrations of their nutrition facts and health benefits.